Need help on selecting parts for the mini-itx build which has to double as a work pc, gaming pc, steambox pc (will be hooked to 1080p monitor) and low TDP/temp as my ambient year temperature is between 26-34C (Malaysia). It also has to be a small pc, if not will look out of place next to the TV. The GPU may drive two 1080p monitors. One normal PC monitor, and one LED TV. This system will not be OC as it defeats the purpose of a low temp, small footprint pc. At one time I did consider the A10-6800K with no GPU, but it can't drive 1080p games. CPU Cooler:? I think stock cooling is fine? But if watercool is worthwhile, I will consider it. Asus Z87i-Deluxe-wifi/bt feature. I wanted a gigabyte sniper.m5, but they don't make a mini-itx version with build in wireless card. MSI NV760 TF 2GD5//OC -60C full load 312 W. or the MSI Lightning 770 (327W) but I don't play Farcry 3 or FPS now (retired some 10 years ago) and the most intensive game I have is XCOM:EU. Most of my games are lego games or indie titles with 2 player capability via steam. Casing:? Need to be able to hold 1 SATA HD (2TB WD Black), 1 SSD (OCZ Synapse). Optical drive a must, though can be external. I was thinking of using the Lian Li PCQ-08 (as the smallest case) though I am not sure now with the Asus Z87i-motherboard as it has that separate PCB board on it. Here is a tomshardware build with a msi motherboard, As you see in the picture, the SATA ports of the MSI are limiting the water cool setup. Based on that, is is not possible to install the watercool fan inside the case, which is annoying. Asus z87i-deluxe, Asus ROG will not work with a watercool at the top. The Asus H87-plus works, but there is no built in wireless. The MSI board will not work also as the ports are all at the top. Gigabyte Z87and H87 too. The Asrock board, might work, though I am not sure. Any ideas on the RAM, PSU, casing and CPU cooler? I doin't mind a H87 board. Not going to OC it anyway. The Prodigy is fine (simple answer, but is it possible to do it in a smaller case?). The handles/feet of the Prodigy are things I can do without. Makes the case shorter in the process. Is it possible to outsource the Dell X51 desktop case and PSU? Then everything can be fitted to something smaller. My budget is up to USD1.5k for this W7 build. I have a retail copy of W7 64bit and the SSD and HDD. So the price is for the other stuff (CPU, GPU, Case, RAM, Coolers, PSU, motherboard). I have screwdrivers and a drill. Not enough tools. So not going custom build. Finding retail stuff. This system will be stationary next to the TV in the bedroom hence a low TDP, low temp build. Most demanding work software: Adobe Photoshop. If not the rest are MS Office.I do tend to open 30 tab browsing at once and go from tab to tab as my net is not that fast. There are others on the board that are into mini-ITX builds. So, I'll leave the case recommendations to them. CPU: In general, you might want to wait until ~September for your Haswell build. The currently released chipset has a bug in the USB3 controller, where devices sometimes aren't recognized when the PC returns from Sleep. The user fix is to dismount/remount the device for it to be recognized. Intel is releasing the fixed chipset to mobo mfgrs in end July...so it might be Septemeber when the new versions are available. Plus, BIOS and firmware revisions should be slowing down by then. If, that doesn't bother you, then disregard this paragraph. In specific, get the non-S part. If you find you have thermal issues, you can always underclock and undervolt the processor to meet the S part specs. If you don't have thermal issues, then you get the added performance for the same price. CPU cooler: Stock cooling isn't fine if your goal is to operate at 34C ambient in a small case with a 170W GPU and want it to be quiet and cool. However, there are many excellent aftermarket air coolers. Pick your case first, then you can spec the cooler. Mobo: Asus is well liked here for it's s/w controlled fan profiles. Haven't seen a review for that particular board, yet. Don't know if it's a good build or not. Gfx card: You don't need to go bigger than the GTX 760 for 1080p gameplay..and $250 is a great price point. The MSI Gamer version has gotten some great reviews. You can use MSI's Afterburner s/w to create a custom fan profile for gaming / non-gaming activities as well as it's framerate limiter -> low intensity games: your GPU isn't running at 240fps while driving a 60Hz monitor (using 2x the power and running much higher temps/fan rpm). RAM: Photoshop is the only app you've listed that may need >8GB. Here's a great tutorial from Puget Systems on CS6 RAM optimization. PSU: Your stressed system load (assuming the 84W Haswell and GTX 760) is ~ 300W, with likely gaming load of <270W. So, a fanned 550W is a good choice. Narrow down your case choice and then we can choose a PSU. I think two best cooling cases for a small factor are Silverstone TJ08-E and Bitfinix Prodigy, even though the Prodigy is mini ITX its similar to TJ08-E in overall dimensions, maybe a little smaller but not by much as they design it to fit big gpus, and a can use 200mm fan on front, and has the handles that even elevate it some.... so at the end is a very similar foot print. Both should handle a gaming config fine, i like more the TJ08-E out of having a little more room to work and organize cables etc, but with some effort the prodigy can end up very nice also, the prodigy has easier managing of hdds, but if you were to run one ssd + one mechanical the TJ08-E ends up better imo. At the end between the two is what you like more, both should do a great small factor pc. Q08 is slightly smaller but not not small, but it comes with only 1 140mm fan on front 120mm on top, hdd cages obstruct the airflow and the PSU is on top of the GPU/CPU, this will not allow the use of tower cooler, even horizontal coolers are limited, there are options out there but wont be as cool as tower, imo not worth it. Both Prodigy/Tj08-E are better cases for a gaming, the Q08 imo is better for a small server with lots of 3.5 hdds, than a gaming case. Personally i dont find S/T cpu worth the buy, they are simply downclock versions, and all sandy/ivy downclocked to same default clocks, and consume similar so I would go for the standard if you are not overclocking Intel Core i5-4570. I would go with an aftermarket cooler (no watercooling) that will allow you to run it a very low rpm and still keep good temps. But it will depend a lot into which case you end up. Just going to suggest a couple of threads where you can see builds and you can get an idea of what you can fit in terms of cpu cooler,OCN Silverstone TJ08-E Owners Club and OCN Bitfenix Prodigy Owner's Club , my personal suggestion would be Thermalrigth HR-02 Macho, on the TJ08-E it should fit great, on the Prodigy you wont be able to use the back fan, but i dont think it will matter much, specially if you use the 200mm fan on the front. Would be ideal to go with something like in the thread above, most of them use Asus Z77 Deluxe-i, as it has the CPU socket a away from the PCIe allowing the use of tower coolers on it. So my suggestion goes into look for a mobo that has similar disposition of the components, im going to assume (but you crosscheck it) that the Z87 Deluxe-i has the same. Asus is launcing soon the ROG Maximus Impact wich will be the first gaming oriented mini itx mobo, so might be worth the wait, then again you are not overclocking so might not be worth paying premium for such a nice motherboard. The impact will have a module for PCIe wifi card on the IO shield, but worth mentioning the WIFI is not included, so you will need to purchase it seperatly. Now if you go micro ATX, since you like the Gigabyte Sniper M5 and add a wifi PCIe card, like Gigabyte GC-WB300D 1Mbps/2Mbps/3Mbps Data Rate Exclusive Bluetooth 4.0/Wi-Fi Expansion Card Motherboard. Also Asus Maximus IV Gene, is micro ATX as the snipper, but has a PCIe on the close to the I/O (on the top) that should take wifi card (its the same module as with the impact), but the wifi card doesnt come with the motherboard, you will need to get one, but there are lots of options out there, like Intel Ultimate N 633ANHMW + you will need some antennas, if you want to place them internally maybe in the back of the case, Laptop Notebook Wifi Bluetooth WWAN/EVDO/HSDPA Broadband Internal Antenna. As steve pointed out before, MSI Gaming N760 TF 2GD5/OC GeForce GTX 760 2GB 256-bit GDDR5 PCI Express 3.0 SLI Support Video Card seems to be one of the best GTX760 atm, it has great performance/noise. PSU:? I think a 550W PSU is enough? It should be more than enough for your setup, SeaSonic G Series 550-Watt ATX12V/EPS12V SLI Ready CrossFire Ready 80 PLUS GOLD Certified Modular Active PFC Power Supply SSR-550RM should be a decent choice. If your budget allows look into Seasonic X-560 or Kinging LZP-550. Any ideas on the RAM? 8 GB ram or should I get 16 gb? Most demanding work software: Adobe Photoshop. If not the rest are MS Office.I do tend to open 30 tab browsing at once and go from tab to tab as my net is not that fast. Ram get something that its on the approved list of the motherboard you chose to garantee compatibility, Asus is fairly good at having a PDF for all the memory they tested and works. HR02 macho will allow to use almost any memory, even tall as the design doesn't interfere with the memory. I would probably go with 16gb of ram, for gaming 4 is enough, 8gb is recommended, but i usually im gaming with lots of webpages open, sometimes even in two games, maybe not playing both but in Auction house in one and playing the other... and so on, sometimes 8gb gets almost used, so i would build with 16gb since you like to have much stuff open, but this is something you can also upgrade later, so if your approaching your budget, i would go with 8gb. The Prodigy is fine (simple answer, but is it possible to do it in a smaller case?). The handles/feet of the Prodigy are things I can do without. Makes the case shorter in the process. You shouldn't take the handles off, the PSU breaths through an opening on the bottom, so it needs that spacing for it to grab fresh air, with the feet/handles it almost the same dimensions as the TJ08-E, so either will be fine. Is it possible to outsource the Dell X51 desktop case and PSU? Then everything can be fitted to something smaller. I doubt it. Its their own design. Personally i strongly suggest against proprietary components like cases/psu as down the road you will not be able to upgrade it, so again you will have to spend full amount for PC, while most of the times building your own you can gradually upgrade according to your needs, with 4k monitors coming in the next few years, you might want to upgrade to sli, etc. Its better to have options open. Case has to be quiet too, as a noisy case is also useless. On TJ08-E i can tell you that even with the low (900rpm) switch the 180mm fan is not quiet, you will need to undervolt it around 600rpm becomes decent at less than feet, but its farther away you might be fine with 900rpm, i would still recommend to grab a Zalman Fanmate2 that will allow you drop it down 600rpm and will end up with enough cooling and very quiet setup (or if you go with asus to use FanXpert2 to setup the the fan), this is how my TJ08-E is atm. Try if you can to invest on the Seasonic X-560 / Kingwin LZP 550 it will be fanless most of the time and very quiet when your gaming, while the G550 always have the fan on. I did not know about the haswell sleep issue. No wonder motherboards and CPU's have been slow to release. I can wait until Sept or even October-though it is torture . 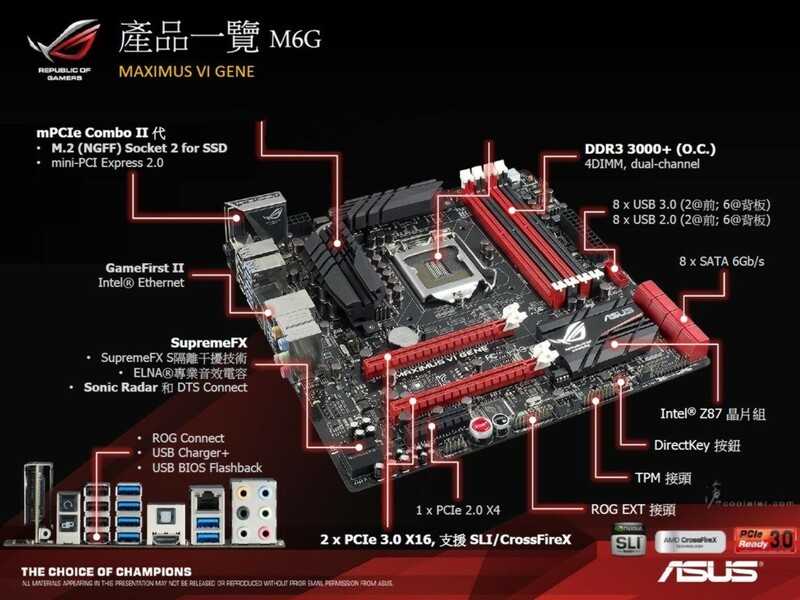 The Asus Z87i-deluxe motherboard is not even released yet. I'm guessing because of this problem. I see. Thanks for the tip. What about the T CPU? Should I avoid that one as well? Which CPU should I get? I don't think I need a i7 CPU. That Asus mb is not released yet. I'll wait for that to be released then will get all other components. I read at http://www.guru3d.com/articles_pages/geforce_gtx_770_sli_review,24.html that 770 is the highest you should go for 1080p gaming. Note that I may run 2 monitors from one card (1 LED TV and one proper desktop monitor). I guess I can always switch one monitor off for max gaming experience. Yes. Case is the issue. I have been researching a lot and still can't make up my mind. The case I want the Ncase M1 does not exists yet, so that is out. I just don't some some CM stacker case next to the TV/AV equipment. Waste of space. Thanks for the reply. I like something narrow and tall. I don't mind that as it takes less space on the table/floor. I like the Falcon-Northwest Tiki case. Looks like I will go with the TJ-08E unless something better comes along within this year. Thanks for the article links. Will look at it. I am not that keen on watercool, and only reason is that if there is significant case size reduction without loss of performance. Is the TJ08-E noisy? I don't mind noise if it is tolerable. I also don't mind changing the biggest fan/quieter fans just to lessen the noise. Noise will not be problem if I'm watching games/movies. Will be a problem if I decide to leave it on overnight. What are the major sources of noise in the CPU? I always thought it was the GPU with its blower fan configuration-especially under load. Yes, the Gigabyte Sniper.m5 can be used with the TJ08-E. I have heard the youtube video of the motherboard with the amp on/off in action. I can clearly hear the difference. I care a lot about the audio. I have good/proper hifi set, a Panasonic RP HTF-600, and Creative T20 Series II. One thing I dislike about the board is that it does not come with built in wifi. Also only Asus has the connectors soldered directly on the PCB. All other motherboard manufacturers with built in wifi/bt on the motherboard have 2 wires running from the back port to the chop. The wires look so thin that they can snap at any moment. I'm quite afraid about the durability. The Wifi/BT PCI card does solve a problem but if Asus can make a ROG Maximus Impact without wires going from the wireless to the board, why can't everyone else do the same. Those wires remind me of that audio jack cable you use to get with CD/DVD drives that run from your drive to the motherboard for old version of windows as windows cannot play streaming audio from the optical drive. I am very interested in waiting what the ROG Maximus impact sounds like. Is it possible to have a bigger antennas on the the PCI-E wireless card? The room I have in mind is quite a distance away, and I plan to use the onboard wifi as an access point via connectify. Saves me the trouble of getting a AP. I don't mind getting the Gigabyte motherboard if the difference between that and the standard Realtek ALC-888 codec is huge. Did not know that about the Prodigy. Good thing you mentioned that, if not I would have regretted it. I don't mind how the case looks like as long as it functions well with my requirements. I see. I did not know that normal CPU's downclock as well. Might as well got a proper i5 then. Will there be a "P" version i5? Thanks for the PSU recommendations. If I go down to GTX 760 card, I can afford a higher PSU, though there is no fix budget on this build. The TJ08-E itself its not noisy, and even the stock config its not that its noisy but loud, the frontal 180mm fan moves a ton of air at 1200rpm but its very loud, the case has a 2 speed switch to lower the rpm of the fan, but the low settings is still too loud for me (900rpm), but this is with the case very close to me, maybe a feet or so, probably in your case this might be enough if you are a little further away, but my recommendation is to grab a Zalman Fanmate 2, that will allow you to lower the rpm even below the 900rpm of the switch. To me the fan becomes decent at 600rpm, where it still moves decent amount of air and its start to become inaudible (at 2am when all is dead silent i can still hear a small whosh, but not a bid deal either). Yes, the Gigabyte Sniper.m5 can be used with the TJ08-E. I have heard the youtube video of the motherboard with the amp on/off in action. I can clearly hear the difference. I care a lot about the audio. I have good/proper hifi set, a Panasonic RP HTF-600, and Creative T20 Series II. If you care about audio and headphones, get an USB External DAC with better components aislated from the PC noise/interference, this what most PC audiofiles do. Or at at least get a dedicated sound card, all on board are crap, at least for people that are picky about audio, for me its fine and personally i vaule a lot the stability of Realtek built in over crazy unstable Creative cards, but i value more stability over quality, each person has their own preferences. One thing I dislike about the board is that it does not come with built in wifi. As i posted before, you can go with PCIe add on card, this is not a big deal unless you really planning on going sli, if Gigabyte Snipper M5 has the the rest of feature you like, then just add the wifi card. Is it possible to have a bigger antennas on the the PCI-E wireless card? You can get aftermarket antennas, there are higher db, really depends what card you buy. The room I have in mind is quite a distance away, and I plan to use the onboard wifi as an access point via connectify. Saves me the trouble of getting a AP. I don't mind getting the Gigabyte motherboard if the difference between that and the standard Realtek ALC-888 codec is huge. I would recommend to go wired not wirless for gaming, specially long distances, but if wifi is a must, then go with Access Point or those new repeaters. Remember to keep in mid the MSI GTX760 that seems to be best atm in terms of noise/temps. On the PSU i think if you are building a quiet pc is worth it, but its your money, you decide. Remeember to grab a good cpu cooler, the hr02 macho fits fine the TJ08-E. Thank you for that reply. I've narrowed my choices to the MSI/Gigabyte 760. As for 770, the MSI 770 for now. I see. I have no plans to turn it on 24/7 for now. I have done it in the past. I need to turn on the AC while sleeping at night and can't use the fan as it is too hot. I will go with the TJ08-E first, set it up then see if I need a fan controller. If I can accept the noise levels then I don't need the controller. The sound card has to be on the motherboard. Either an external card or not as it will drive the speakers. I do have proper headphones, but with the ROG VI Maximus Impact (mini-itx) and the Sniper M5, both come with Amps. My headphone does not need amps, but it is good to know that it is there. If possible I would like to do without any PCI-E cards just to not restrict airflow to the GPU. The CPU is cool and even with torture, will not be as hot as the GPU when playing games. Thanks again for the help. I think I have a good idea of what to find now. I will go with the TJ08-E first, set it up then see if I need a fan controller. If I can accept the noise levels then I don't need the controller. As i said before, the TJ08-E has a fan controller, well its just two speeds, high (1200rpm) and low (900rpm), test it and see how it goes, i personally didnt like how loud it was, but its understandable with the amount of air the 180mm fan moves, even undervolted moves a decent amount. In case you want to read more, SPCR did review the case and got the editors choice, SilverStone Temjin TJ08-E: MicroATX Evolved. I really wanted to do a mini itx build on haswell, but the Impact dont have 5.1, it seems more oriented for heaphones or 2 channel speaker (but this i dont know for sure as the mobo isnt released officially yet). Now the impact does seem like a very good option for Prodigy, but for TJ08-E.. idk, there is Asus Maximus IV Gene which is also Micro ATX and does come with the same WIFI/M.2 PCIe port on the I/O shield, so this would be my choice for TJ08-E or the sniper if dont mind the extra PCIe wifi card on the 4th slot. Personally i don't think its much difference, GPU sits on the first PCIe slot, and the GTX660ti is a two slot card, the PCIe WIFI sits on the PCIe 4th slot, so there is still one slot in between the wifi n the gpu, and even then the card is low profile so imo doesnt really restricts much the gpu from having adequate airflow or breathing room. And more importantly the airflow on TJ08-E is massivly supplied by the frontal fan, so there is a lot of air getting to the GPU. I can understand what you saying and maybe there is a slight difference (i didnt measure with n without the wifi card) but the temps are really good still under gaming, so i didnt really bothered. In the build im doing in week or so (the parts are on customs still) ill be using Asus Maximus VI GENE + GTX780 + Acelero III, this is 3 slot aftermarket GPU cooler, so at the end i have only 1 slot for breathing (the PSU is right above the GPU), and i have done fine with my current build, bearly my card breaks 60C while gaming, this is the main reason i went with the same cooler again and with TJ08-E, and this makes me think you will also be fine with PCIe wifi card on 4th slot in case you decide to go that route as the MSI GTX760/770 is a two sloted, so will be similar to mine. Either way, i dont want to force you into doing something you dont want, so my recomendation is to consider the GENE over the Impact and the Sniper, as it will have the WIFI as the impact and you will have all the PCIe slots empty (aside form the GPU). Keep meaning to post on this. I recently built a mini-itx system in the BitFenix Prodigy, and it's a fairly quiet little system. I got an msi board that had 6 sata ports so I could use the disk space to set up a mirror of my main file server, no extra video card in it. But I did put in a front 200mm fan, so that seems to be working out. The cpu is an i7 4770k with a prolimatech megahalems cooler on it, I've overclocked it up to 4GHz, but I probably won't push it much higher than that. It's a decent case, but look for a shorter psu, I got a silverstone strider psu, seems quiet enough but I got some extra head room in case I want to install a gpu. Currently I'm just using the on board video. But yeah, it's a decent case, not too far to work with, and it has a bunch of little 2.5" drive mounts I didn't even notice. So far, so good. I did read that review. That is why I'm now changing from Prodigy to the TJ08-E.
Don't worry. All motherboards now should support 5.1 audio by default. Only difference are the 7 or 8 channels. Do you think your CPU heatsink is helping in cooling the GPU? Looks like it is touching the GPU, and heat could probably transfer to the heatsink as well. I also don't mind using the Z87i-Deluxe in the TJ08-E. It has wifi. So why bother with the extra PCI-E slots. I like the ROG lineup, but unless you go the full size ROG, it seems that the wifi card is not included. All that is included is a mPCI-E slot. In terms of value, the standard Asus Z87 series with wifi seems better value. Also included is the magnetic antenna included can stick on the case. Thanks for the feedback cordis. Do you really think the Impact has 5.1 support with only 3x 3.5 plugs? One should be microphone/line in, unless they force the mic to the front panel and use the 3x 3.5 plugs for 5.1, but i doubt it. Its not touching, it has like 3mm between, if i didn't use the support cage it will touch though. And i didnt want it touch for two reason, extra weight to the cpu... and it could short the gpu. But the gpu is getting some air as its very close, not that i think it matters though. This is up to you, i do prefer GENE for tj08-e, but its your choice. Btw, i just stumble in another thread that might interest you, Corsair is getting feeback for mini ITX case, and seems its going to be smaller than the Prodigy. If you wish to read more check Corsair Mini ITX? What do you want? I can't give you guys any updates during the development stage, sorry. Too much stuff in the air, and obviously our competition reads these forums as well so I don't want to tip our hand. I will say that we have a design that's smaller than the Prodigy, and we're working on multiple external looks for it, one of which is Obsidian family. Now that you mentioned it. Yes the ROG Maximus impact may not handle 5.1. Sorry, my bad. BTW, what is the difference between the Hero and the Gene. Both are ROG boards. I tried the comparison at Asus's website. I can put stuff to compared, but there is no compare button. Some boards do have 5.1 with only 3 jacks by using combo jacks for separate L/R and shared ground (think of a 3.5 headset jack). All 5.1 boards that I know of only use 3 jacks. Yes, some 6.1 and 7.1 boards might offer more jacks and when set up for 5.1 use more than 3 jacks but 5.1 boards have traditionally only had three jacks: green, pink and blue in the PC 99 design guide. The pink and blue also can be used as mic and line in as an alternative to outputs.